Got a bit of a scare from my mother recently- said something about how she had seen my niece on her birthday. I was surprised to learn she was already a year old, but was told it was her "11 month" birthday. Still, I've made two artworks for her and it seems like she (her parents anyway) should get at least one of them real soon. The saint was done a long time ago, has been seen (and praised) in two critiques, been submitted to two juried shows (rejected from both), and it seems like a good time to make them a copy, but I can't find the block at the moment. Doesn't seem to be in the Studio, so it's probably buried under something in my apartment. Probably turn up as I am gathering stuff for the print workshop next month. 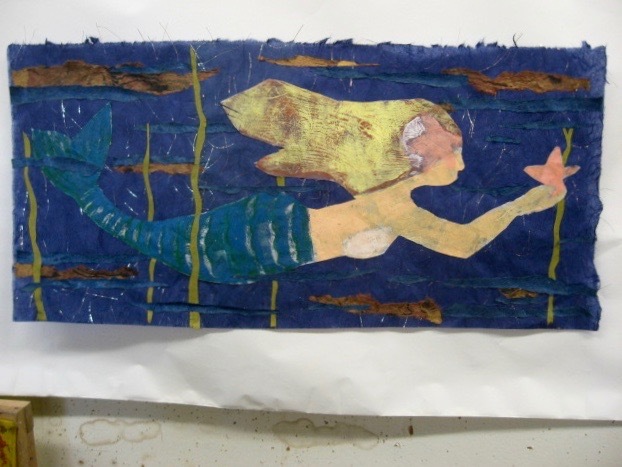 The other thing is the mermaid sculpture, which has been used to make prints, and the coloring was done back in January. The thickly applied ink took longer to dry than I expected, but a few weeks ago I saw that it was ready to go. Just needed a hanging wire. My brother called me this morning to invite me over for homemade meatless (Good Friday, you know) pizza tonight, so I figured it was about time to turn the mermaid over to the intended recipient. The logical place to attach a long wire is from end to end, say tail to head, but then the wire would have to cross a big empty space, and I didn't know if they would like that. In the end I attached two wires- one from tail to shoulder (probably not balanced) and a short one behind the hair. My niece was already up to bed when I brought it out, and since she's not yet talking, I have no idea what she'd think of it anyway. The two older children were both a bit envious of the piece, so I expect I may get a request to make some new sculptures in the near future. But at least I'm done with this one. So, you want to do woodcuts but have no experience. No problem. I saw some examples of German Expressionist woodcut in an art history book, decided it would be cool to try, and I took the approach of figuring it out. Found a nice sanded hunk of pine plank where I worked, did a sketch on it in pencil of a portrait, based on a photo in my college yearbook. I never had a lesson, or owned any woodcut tools, but I understood the basics of relief. I cut out the design using a drypoint needle, a carpet knife, and a small screwdriver. Got a simple brayer and some Speedball ink, and ended up with something I liked. (if I can find a copy, I'll post it) Did more, liked those, too, decided to take a class, and the rest is history. Now if you'd prefer to have someone show you the basics, teach you about tools, inks, papers, etc, that's a little trickier. If you can even find a college that teaches printmaking (fewer and fewer over the years), they may not cover woodcut, or may not teach much. Several years ago I was hired to print four editions for a college print student who was too injured to do it herself, and she was astonished to learn you could print blocks by hand without a press (I had to make some quick BAT's for her unprinted blocks and didn't have time to clean the junk off Molly's press). And last year when a senior at my university wanted to include large woodcuts in his final show, he remembered that I had told him about better tools and where to get them, not the official print professor, and asked me to be his faculty. And some of the organizations that used to teach woodcut just aren't anymore. Thanks to the internet, people who want to learn woodcut in New Jersey often find me. I may need to count on that again. Had a successful workshop last summer, six participants, including one who had searched the state looking for a place to teach him. Here they are in action. Belmar encouraged me to do it again, and also asked if there could be some kind of printmaking themed show for the gallery. A few months later I was approached by one of my longtime students there about an idea for a show, something from her and an old college friend out west, which seemed to suit their needs. I brought it to the director, who liked it and gave us an exhibition slot in September 2018, with me promising to offer my woodcut class a time or two for those who needed to learn the process in order to participate. The only way the class happens is if people sign up for it, so we'll see what happens. Meanwhile I'm doing what I can to promote it. Been talking it up for weeks, and now I'm promoting it here. 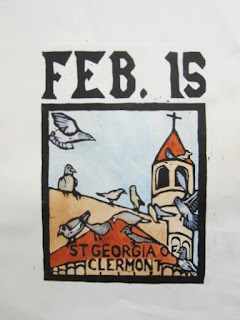 If you want to learn woodcut here in New Jersey and the internet brings you here, just take the link to BelmarArts.org, and click on the tab for Education on the home page. That will show you woodcut printmaking in a drop down menu, which will give you the information and a registration form. This first print series will be on alternate Tuesdays in April and May, starting April 10, 2018, and includes 4 sessions of 2.5 hours each. 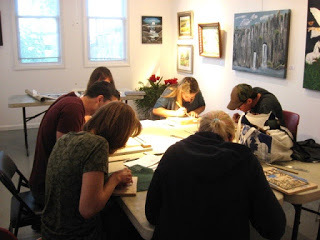 Paying participants get basic wood, ink, and paper, plus access to cutting and printing tools during class meetings, as well as instructions and advice, all more than I ever got when I started. Whether or not this spring class happens, I will offer it again in the summer if they are willing. Maybe someone reading this will find their way there. Two weekends are done now, and the field of 68 teams has been cut down to 4. Results are about what I expected. I entered this round with two of my teams still active. Syracuse had won its play-in game to get the #11 seed, then won its way to the sweet 16. This weekend they got to go up against Duke and it was the end of the road for them. Meanwhile, Villanova won games over West Virginia and Texas Tech, and earlier today claimed a spot in the Final Four, which one might expect from a #1 seed in their region. The above mentioned results match up with my predictions for the bracket, so I can't complain about them. The rest of my bracket was not so good. My Midwest region (which is where Syracuse was placed) was pretty good- only two games wrong out of the 15 that cut the teams to one. And that one, region representative Kansas, was one I picked. One of the big surprises right now is that Loyola- Chicago, which won two early round games on last second shots, had some decisive victories this week to get a Final Four slot of their own. Which means that the automatic bid from the Missouri Valley Conference (which one of my alma maters is a part of) has as many teams in the Final Four as the Big East, and more than the ACC. That's sure to upset a lot of people, but I'll take some pride in that. Meanwhile I still have Villanova active and can pick up a few more games in my art school competition. More on that in about a week. For the past few months I have had art on display in Spring Lake, the Upper Gallery in the Community House, an large old brick building that holds the town library, a theater, and some meeting rooms. Lately there is a push on to use the largest such room as a gallery space (thus the Upper Gallery), which has resulted in me being part of 3 shows there. The first was a juried show put together by BelmarArts, the second was a group show where artists from the first show were invited to apply, and the most recent show was an invitational of sorts. It's the Artists/Activists show, organized by a regional artist group where I know many of the members. I later found that the show started in a gallery (Asbury I think) and then this was the second location, but the Spring Lake locations was much bigger, and some of the art from the original show was unavailable, which is how I got a last minute invite to put some pieces in it. That show opened back in early December, and the postcard said it was to close at the end of this month. There was a very nice reception, and I have received complements for my pieces from people who have had a chance to see the show. I was a little confused when we got e-mail informing us of a closing reception on March 21st, but receptions don't have to be on the first or last day of a show, so I didn't let that bother me, just wrote it on my calendar. More confusing was the statement that we could take our pieces home that night, or had to come back the next day to pick them up, about 10 days before the advertised end of the show. (still haven't got an explanation for this) Still, no problem. For those not from this area, you need to know that we have had an unprecedented series of snow storms this past month, one a week for the past 4 weeks, and we may not be done yet. Forecasts called for the biggest one yet on the evening of Wednesday, March 21st. Actually we had two storms yesterday, a small one of sleet, rain, and other precipitation early, coming from the west, and then later a nor'easter coming up the coast with snow, so technically we've had 5 this month. (and we may get another one this Sunday) Got a lot of errands done during the first one, then parked my car to wait for the second. Snow started falling around 3:00, but nothing accumulated until after dark. But it accumulated big time. As I expected, the reception was called off by late afternoon, and this was a wise idea. When I got up this morning, the roads and my parking lot were plowed, but on top of and all around my car was about a foot of heavy wet snow. At least the sun was out and there was no wind. No word yet on whether the gallery would be open or if they would change the pick up of work, but I figured I should prepare for any possibility. Put on my heavy work boots and trudged out to the parking lot to deal with my car. Took a break after about two hours, checked e-mail and found that the gallery had managed to open today. So a few minutes later I was back outside, finished the excavation of my car, grabbed a large tote bag to hold my art, and drove down the hill to Spring Lake. Packed my two pieces, back to the car, and on to the next errand of the day. The organizer mentioned in e-mails about the show returning to another gallery soon, but I don't know if it's the same work, or another show she's organized. I guess I'll find out down the road. Here at Studio Arrabbiata we always do something to acknowledge and celebrate St Joseph's Day. March 19th is the Feast Day of St Joseph, husband of Mary, who raised Jesus as his own son, and I assume served as a significant male role model. Carpenter by trade, thus the patron saint of everyone who works with wood. Also the patron of many other professions and people, including the nation of Italy and (somehow) bakers of dessert items. More on that last item later. Spent the day working on school stuff mostly, but here at the Studio we celebrate things Italian and among our people we do have some traditions. I know of no specifics for meals, but I always choose a pasta dish, which is my meal choice more days than not. 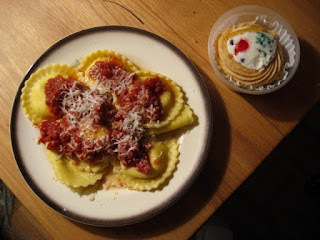 In today's case it was cheese ravioli (frozen type, as I don't have the time to make them from scratch, or a staff to clean up after me like all the tv chefs do) and a quickie tomato sauce from canned tomatoes, olive oil, spices. The dessert is specific for this day, a filled pastry. Most common is to start with a large zeppole, though a sfinge is also acceptable, and stuff it with cannoli cream, or sometimes whipped cream or custard. Often a cherry or candied fruit is added. You see one above, just to the right of my plate of ravioli. The chocolate chips are not required, but I wouldn't turn them down. Happy St Joseph's Day Everybody! All of the relevant games for my tournament are complete for this week. The NCAA Men's Basketball Tournament started with 68 teams, and is now down to 16. There won't be many people out there who accurately predicted those 16, lots of wild finishes and upsets have made a mess of my bracket, and I expect I'm not unique. But there was some good news, too. I need to produce a new curriculum vitae soon, so I devoted time today to digging up information from the past several years. The last one I did was about 5 years ago. I haven't put it all down in one place lately, but at least I have the information here and there. For example, this blog has more than an decade's worth of my artistic history. It would take a long time to read all of it, so I have been relying on memory and using the blog to verify things I remember. Today I was looking up something way back, ran across one of my old Tournament of Art pieces, and it mentioned that I had a link to the main University of Texas, not just the branch in Arlington that I know well. Just a few days ago I wrote that I had never had art there, but could I have forgotten? Thinking about it more, I vaguely remembered a group show, something organized by someone else. I looked at my comprehensive exhibition list, and found it- University of Texas at Austin, 2001, a showing of the Culture Rot group folio. Predates this blog by several years. I guess that's how it slipped my mind. What that means is I actually had 3 teams in this year's Tournament of Art. So that was some good news. As for my original two teams, so far so good. The #1 seeded Villanova players easily won their first two rounds, and joined the sweet 16. And Syracuse has won three games, a play in game to get the #11 seed, and then upsetting a #6 and a #3, and now is also in the sweet 16. Meanwhile, Texas lost their first round game before I realized they were part of my tournament. So schools that have shown my art won 5 of their first 6 games last week. If there was some kind of evidence that showing my art can lead to sports success I would share it with many schools, maybe get some more shows as a result. Meanwhile I have to get ready for three days with no basketball games, which can be a weird feeling after the excitement of the past four days. And on the down side, one whole side of my bracket is done, completely wiped out, no more games left I can win there. The other side, including my predicted champion, is still intact, so I have things to root for. This week I have been on Spring Break from the one school that actually gave me classes this semester, so I've been mostly taking time to relax, but there's always things that have to get done. Even at the school on break. Answered e-mails from students, which I never mind doing. Always happy to help a student who takes the time to ask for help related to classes. But now also have to deal with administration requests, much less welcome. One that was due today was related to a program for college students who really aren't qualified to be college students, but they have tuition checks, so they are accepted and it's left to professors to get them up to speed. Again, I don't mind helping students, but the first graded project isn't due until next week, so I was requesting extending that deadline until I had something to actually tell them about. They agreed. More annoying was another demand that came in yesterday, one that college administrators pull every few years. Someone new wants to know all kinds of stuff about the faculty, and needs us to submit copies of the evaluation forms, our syllabi, a CV, due in about a month or we will not get classes again. I consider this to just be laziness, since all this stuff is in office files already and they can pull it out any time, instead of making us use our own unpaid time to dig the stuff up and submit it again. I found the necessary information this week. Have also devoted time to thinking about the next print project. Have three projects that I plan to pursue, just a matter of deciding which one will be first. Meanwhile, things may be changing at the Studio. Molly informed me early this week that Jackie, our third artist in the space (for the last few years) is going to be moving out soon. This leaves us two options- find a new third person to split the rent, or go back to the two artist system we had for many years- more rent, but more space. More will be decided about this in the future. Not much has been done lately about the planned printmaking show in Belmar, mostly because the new person in charge of exhibitions hasn't responded to questions we have, and we need those answers before we start recruiting artists of the show. Luckily it's not until the fall, so we have a little more time, but we also need to give time to the artists to make prints. The one thing that I have done toward this is to schedule a woodcut series at the location. Good for them, as most people involved in BelmarArts don't know what a print is or how to make one, so if we want people in the show, we will have to teach them. Plus the organizations takes a percentage of tuition for all classes, so they will make money that way, too. And as the teacher of that class, I'll make some money. Got all the paperwork submitted over a week ago, but they have yet to put it on the website or start advertising it. I need to remind them that they have something to gain from this as well. Got most of the supplies I will need to get started, and this week I received the newest catalog from my woodcut supply company. Won't order anything until I find out if I have students, but I am curious about some new inks they are carrying. This week we also got the results of the upcoming big juried show. This is the 14th annual, and I joined in time to be part of the 2nd annual show, back before we had our own building. I've been in it every year since then, winning many awards along the way, but this year I was rejected. I don't take the results of juried shows too seriously- as I tell students, if I get into a juried show or win an award, it means one person liked what I did, and if I am rejected, it means one person didn't like what I did. However, there seems to be some weird things going on here. Out of 49 people in the show, I only know 13 of them, and I've been around long enough to know most of the active members. And 49 is the smallest number of artists to be selected I've ever seen. In the 10 years prior to this one, the shows averaged 81 artists each. All the founders are gone- I don't know if they all left or were pushed out by the people running things now. Many of them are part of a group that has been showing in other places in the area, such as the show I am in right now in Spring Lake. That show has a closing reception this coming week, so perhaps I will see them and find out some answers. And we've had a lot of college basketball on the tv this past week, so I have watched a bit of it. I'll have the results of my Tournament of Art at the end of the weekend, and assuming my schools survive those rounds, more next week. Anyway just because I'm off work, doesn't mean I have nothing to do or that nothing happens. Life as an artist keeps you busy. It has long been my custom this time of year to track all the colleges who have in common a team in the NCAA Basketball Tournament and being a place I have an artistic connection to. That can be a place I took classes, a place I worked at, a place that I have exhibited at, or a place that has collected some of my artwork. There are also schools that I have a rooting interest in, but I don't count those for the tournament. For a while it looked like I might have a bunch this year, but the field was announced this past weekend, and there are only two teams. I have attended two Division I colleges and both were in possible position this season. SIU had a decent team this year, a good seeding for their conference tournament, but lost in the semi-final. The College of William and Mary also ended up with a very good record, a good seeding in the CAA tournament. Watched the game on tv and the announcers talked about how W&M led the nation in 3 point shooting percentage, and were top 5 in many categories, however, in the game that followed they missed almost every shot and were eliminated. And while both schools had very respectable records, it was decided that certain power conferences had to have 8 or 9 teams in the tournament, so without the automatic bid, they had no luck. Some things were close- Harvard and Florida Gulf Coast University lost their conference title games and will sit things out. I have multiple connections to the University of Texas at Arlington, but it's the main campus in Austin that has the team that made it. So in the end I have two teams. Syracuse (exhibition 2005) just barely made it, we are told the last team in as an at-large pick. With an #11 seed in their region, they aren't expected to go very far. In fact, they have a play-in round tonight just to continue, which is why I had to get this up now. My other school is Villanova (exhibition 1997), which is a #1 seed in the East region, and had been a #1 team in the country for much of the season. Seen a few games on tv this year, and when they play at their best they can beat any team in the country. Winning the whole tournament means winning your next 6 games, but they are all against top teams in the nation, so not an easy task. I'll provide updates on my schools each weekend. which is in a frame right now, from when I brought it to a critique group last summer. It is also the piece I brought to last month's critique at Mary's house, where those present seemed to like it. No predicting what will happen with a juried show. I've had pieces rejected one year, and with a different juror the following year, win a prize. And while the juror and I are both adjunct members of the same college faculty, I don't think we've ever met (life as an adjunct) and I've never shown anything like these pieces at that school, so she has no way of knowing who submitted them is she did know me. But I got them submitted ahead of the deadline, so I'll have to wait and see what happens. I'll post the results here when I know them. A print project that I started last year finally reached its end today. Part of the length it took is probably because it wasn't necessarily intended to be a print project, but these things happen as they do. 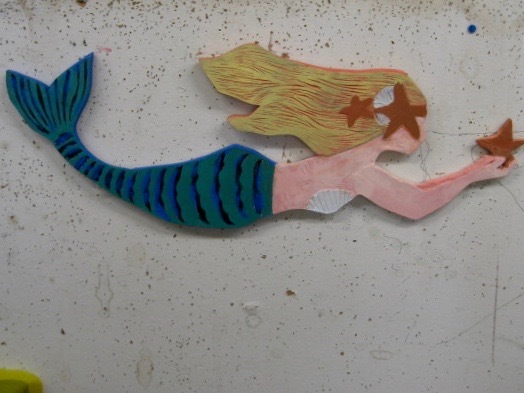 At one point last year my brother's wife asked me to create a sculpture based on something she had seen on the internet, a wooden mermaid. I had her print out a copy for me. Basically a profile along the length of the body, from tail to outstretched arms, hands holding a starfish. I hadn't carved wood with the plan of making a sculpture to be seen probably since high school, but I do have a few degrees in wood carving, and a large supply of woodcut tools, so I took the challenge. Went with 1/2" birch, what I'm using for woodblock prints these days, gridded out the mermaid shape, sketched it in pencil, then used a saw to cut it out. Over a period of time I carved the figure with a fair amount to detail, in low relief. The original plan was to keep the wood in a more natural state, but eventually I decided that color would make the relationships of figure and objects clearer, and having been reunited with my supply of water soluble color relief inks, had a plan. Not wanting to waste the effort of carving the wood, I decided to try something I hadn't done since the 1990's, making prints as a rubbing, I draped my mermaid block with some thin Japanese paper, and rolled brayers with various colored ink over that paper, building an image on the top surface of that paper. Different colored inks for different parts of the figure. Set those "prints" aside to dry, and by last October they had done so. Had no plans for what to do with these prints, other than to show them to a current college student working with woodcut, but realized if I was ever going to do this, it had to be before I finished the sculpture. This process left some residual ink on the wood itself, having penetrated the thin paper, but not a problem because I expected to use the same colors to paint the sculpture. When used in super thin layers, this water soluble ink dries very fast, but used as a paint, it was taking much longer, and in my design, some parts required multiple layers of color. Was given no deadline for getting the sculpture made, so no problem. Completed the piece this past January, seen above. Just need to attach a wire and it's ready to go. The piece is intended for the bedroom wall of my young niece, and I hope she will enjoy it, though it may be a few years before she can actually tell me what she thinks of it. Meanwhile, over at the Belmar Art Council, we are coming to the time of the year to submit works to the annual juried exhibition and I didn't have much to show. Have been in plenty of exhibitions, taking advantage of having a deep catalog of finished work, and spent a lot of time working paying jobs. I'm sure I could dig up some old things never before seen in Belmar, but I prefer to show newer stuff when possible. I got the idea to make use of one of those paper rubbing prints I had made last year, so on a day last week when it wasn't raining or snowing (sunny days are rare in recent months) I went to one of the last area art supply stores and bought some paper. Colored decorative paper, which seemed the logical way to make this thing happen. I have several sheets of colored/textured paper that make available to students in my woodcut class, but I wanted something that could serve as a blue (water) background, and found some deep blue unryu with gold fibers and picked up a few sheets. The past few days have been devoted to dealing with an apartment fire inspection, but that was finally resolved this morning, so I had art plans for the afternoon. 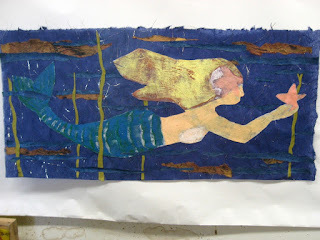 Today I brought my two mermaid prints and all my decorative papers to the Studio, still not sure what I'd be doing. A few days ago I had located two long horizontal frames in my storage of old works, things that would be suitable for the piece, and measured them so I'd know how to format the thing. Left the frames behind for now, but had those numbers with me today. Up at the Studio, decided which mermaid print to go with and used scissors to cut out the figure, placing it on some plain white paper while I figured out the rest. 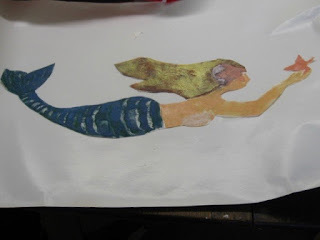 What I had decided on while still at home was the idea of collaging together things from all the colored paper, along with my new blue background and the cut out mermaid. Below is the result. I tore the blue sheet down to a size that would fit the window mat of one of my frames and then started arranging things on it. 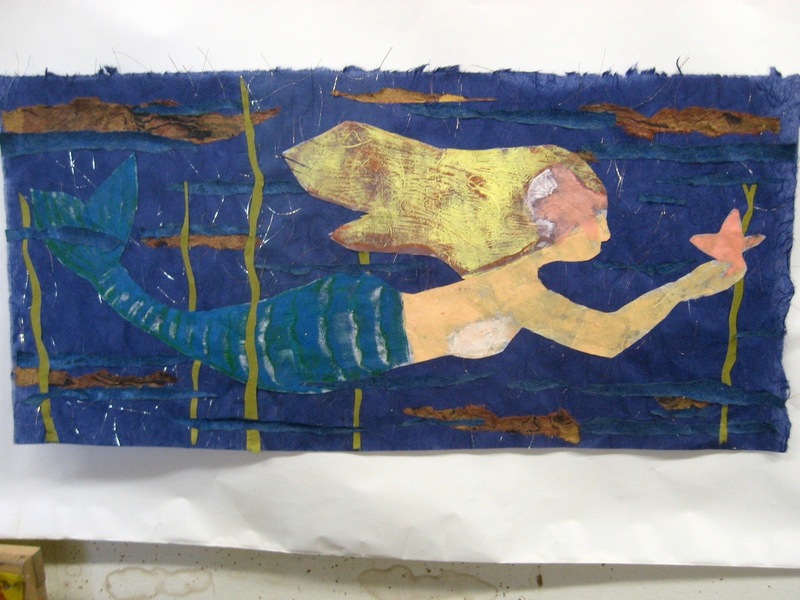 There's the deep blue with gold fibers as my main background, and I tore thin strips of another blue and some brown that had a ripply pattern on it, plus a greenish color that I though would be suitable for undersea plants, so I made some of those. All held in place with some PVA. There is a variety of shape and value. Warm colors and cool colors. Horizontal and vertical movements. Still, not like anything I've done before. For my print projects I generally start with an idea or a concept, or at least a vision, and I work to make that thing happen. However, there is relatively little of me in this piece. I did not select the subject or what she looks like. Mostly I just picked the colors of everything. But it does give me an option for submitting to the show. Deadline is tomorrow, so I'll have to figure out what I'm doing soon.